Condensing centuries of history into one volume, Cities of the World traces the historic form and special character of the world's greatest cities through a breathtaking collection of maps and panoramic views. Peter Whitfield focuses on more than sixty cities—from Athens to Brasilia, Washington to Moscow, San Francisco to Saigon, and Venice to Lhasa. He presents an extremely wide range of maps, historic prints, and photographs from many periods that show how the architectural form and the social life of our cities have been shaped—not only by their geographical setting, but also by religion, royal power, commerce, social ideals, and occasionally artistic vision. These images illustrate the historic heart of the cities: the ancient harbors, the hilltop fortresses, the encircling walls, and the houses, churches, and palaces that have been added over the centuries. For the armchair traveler or anyone passionate about the history of human civilization, this beautiful, unique book captures the richness of the urban fabric and reflects the collective memory of each metropolis. Cities of the World demonstrates how the city was linked to the birth and progress of civilization itself, how it has acted as a focus for ideas and technologies, arts and sciences, and even religious devotion. It shows the ways that some cities grew slowly into haphazard, unplanned beauties, while others were shaped by the will of masterful individuals. Whitfield chose the cities featured here not only because they are richly and beautifully illustrated, but also because they demonstrate a notion of spirit—an outward and inward uniqueness. Many of these historic maps have a pictorial quality that vanished long ago from the functional town-plan. Depicting the classical city-state, the medieval fortress, the baroque capital, and the industrial metropolis, the sumptuous illustrations in this book chronicle how simple outlines found on Babylonian clay tablets evolved into the stylized pictures of medieval times and spectacular bird's-eye panoramic views, finally culminating in the highly functional mass-produced maps of the nineteenth and twentieth centuries. Wonderfully evocative of the places they depict and the artistic tastes of their time, these maps shed new light on civilization itself, with all of its contradictions, shortcomings, energy, and aspirations. 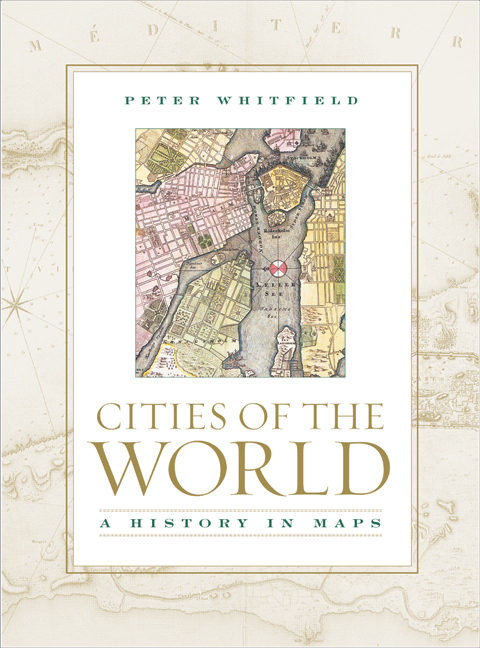 Peter Whitfield is an independent scholar and a leading expert in map history and exploration. He is a former director of Stanford's International Map Centre in London. His previous books include The Image of the World (1994), The Mapping of the Heavens (1995), The Charting of the Oceans (1996), New Found Lands (1998), Landmarks in Western Science (1999), Astrology: A History (2001), and Sir Francis Drake (2004).